My youngest son has been working on a visual handwriting program called Easy Peasy Alphabet. This was made possible with a copy Channie’s Visual Handwriting & Math Workbooks for review as part of the Homeschool Review Crew. Handwriting is a nemesis subject for me. It isn’t that I don’t like showing my boys how to write well-formed letters. Rather it is that they fight me on it! When given the chance to do this review, I debated between the print or cursive version of the program. Easy Peasy Cursive is meant for 1st through 3rd grade and J is in 2nd. However, I knew that his print formation was seriously lacking. So, we opted for the Easy Peasy Alphabet which is recommended for PreK-1st grade. 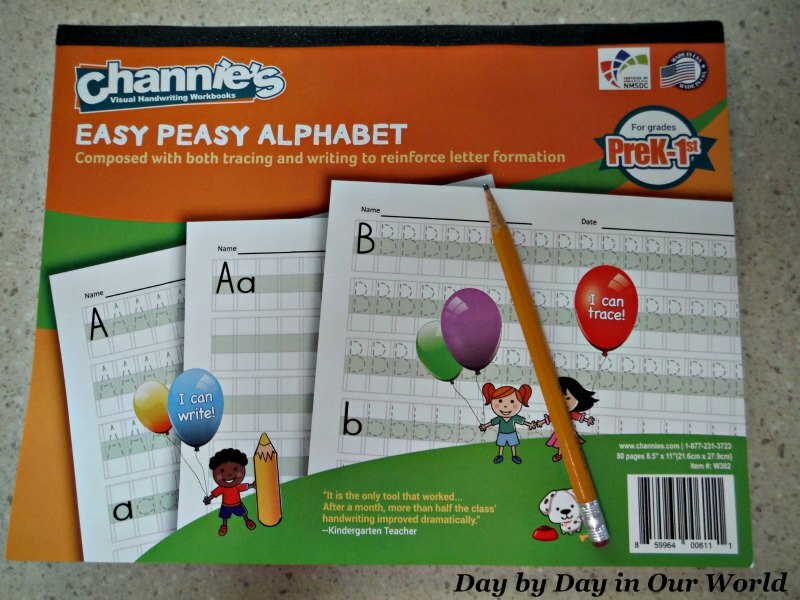 Channie’s Easy Peasy Alphabet Trace & Write workbook is meant for PreK-1st Grade and provides 80 pages of worktext. For parents like me with a child struggling with letter formation, it makes for a great book to learn the proper formation. 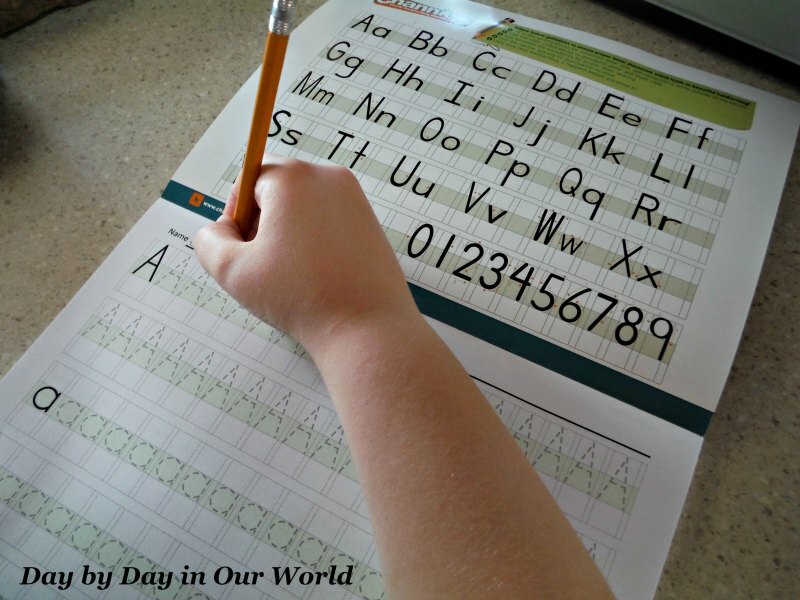 For each letter of the alphabet, the workbook has two tracing page and one writing page for repetitive practice. Each page has space for both lower and uppercase formation of the letter. There are also pages with the numbers, something that everyone needs to learn how to form. Something that makes this book unique is the use of color coding which makes this a visual handwriting program. 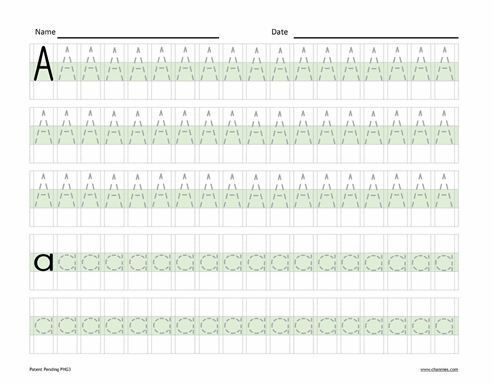 The lower half of each block is tinted a light green to indicate where the lower case goes. This is easier for kids to see compared to the traditional dotted line used in other handwriting books. Along with the tinting, each letter is blocked off to help a child learn proper sizing and spacing. This is SO easy to use in your home. And, I am all for easy! The first day we looked at the chart on the inside of the cover. This shows the letters with starting places and arrows to know what direction your strokes should be. This is the big hangup for him and possibly the reason his handwriting needs so much work. He wants to find his own way to form the letters, yet wonders why his letters do not look great. Tracing each letter before writing it freehand is a great exercise, especially when paying attention to those directional arrows. The color blocking makes it easier for him to self-correct sizing while the lines forming the block help him with spacing, too. I’d love to say that after several weeks his handwriting has seen significant improvement. He does a good job when focused on the page. However, when he goes to regular paper to write a note to his best friend all bets are off. I am confident, though, that continued practice with Easy Peasy Alphabet as well as reinforcing the skill elsewhere will pay off in the long run. How do you approach handwriting in your home? Would this resource be great for someone in your family? Don’t just take my word for how we found this to be. 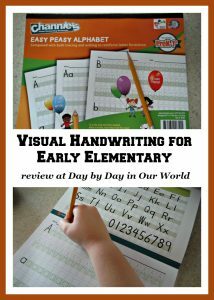 Visit Channie’s Visual Handwriting & Math Workbooks review post on the Homeschool Review Crew website to see what other homeschooling parents thought about this book.